Doesn’t bacon make everything taste better? It’s so funny to think about … but when I was a kid I used to say I was allergic to brussels sprouts! I hated them that much! Fast forward to adulthood … and now they are one of my favorite things! Part of the trick is not to overcook the brussels sprouts. They get too smelly and pungent if you do. You want them to be just fork-tender after boiling them. The second part is the bacon. As I mentioned before, doesn’t it just make everything better?! I like to use a really smoky bacon like Benton’s when making mine. My friend Kelly English inspired me to come up with this recipe. He serves a version of this warm dish as a first-course salad at Restaurant Iris, his popular Memphis restaurant. I dish it up as a hearty side. Trim the bottoms off of the Brussels sprouts and slice in half. Over high heat, bring a large pot of salted water to a boil. Add the sprouts and cook until fork tender, about 7 to 8 minutes. Drain and reserve. In a large skillet over medium-high heat, cook the bacon until crispy, about 4 minutes. With a slotted spoon, transfer the bacon to a paper towel lined plate to drain. Reserve. Pour all but about 1 tablespoon of fat from the skillet. Add the butter and allow it to melt. Add the sprouts and sauté until they are lightly browned, about 5 minutes. Season with salt and pepper to taste. Return the bacon to the pan and toss to combine. Serve warm. Cooking Tip: Regular bacon is fine, but for an extra bacon-y flavor, use thick-cut artisan bacon or Italian pancetta. 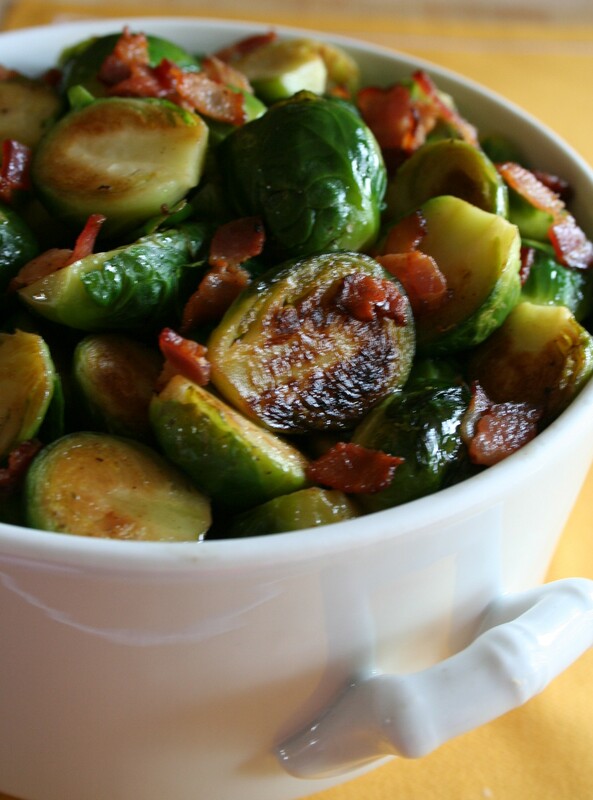 Do-Ahead: The Brussels sprouts can blanched ahead of time and then reheated when sautéed. Being from New Orleans, I grew up eating Oyster Dressing every holiday. I didn’t know anything else existed. Then fast forward a few years (well, maybe more than a few!) and I have a daughter with severe seafood allergies. Gone are my days of turkeys stuffed with a luscious, rich oyster dressing. So back to the drawing board, or stove-top, I was forced to go to come up with a new stuffing for my holiday table. 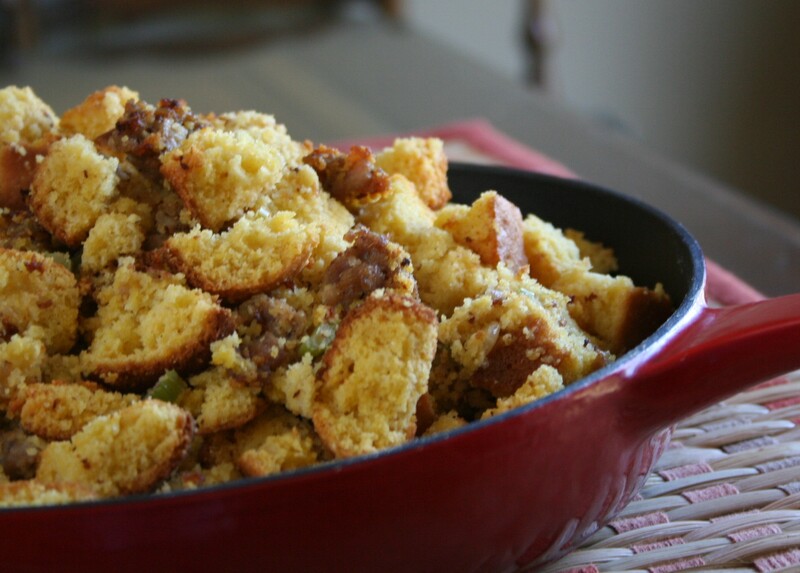 I have a few that I like but this cornbread and sausage stuffing is consistently a favorite with everyone at my table. 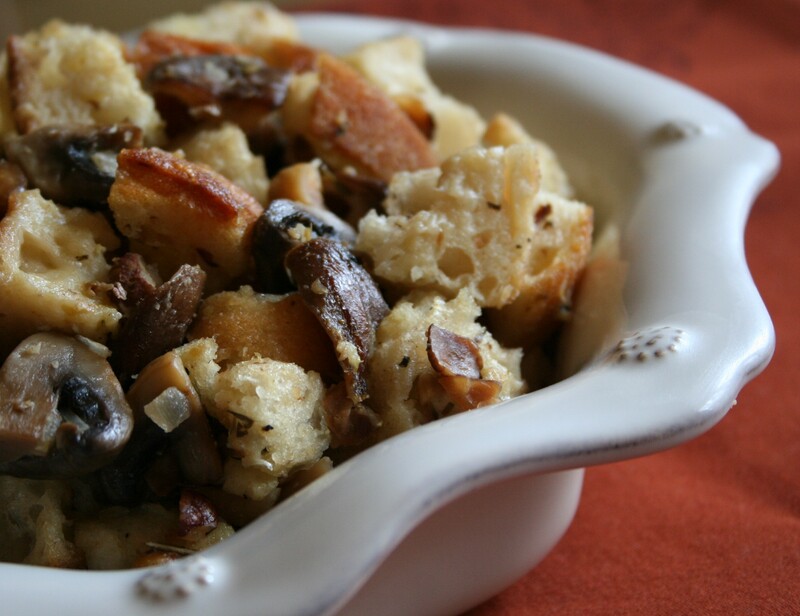 Cornbread stuffing is a Southern classic. The addition of the country-style pork sausage gives it a mild kick… just enough for the grown-up palates but not too much for the kids at the table. 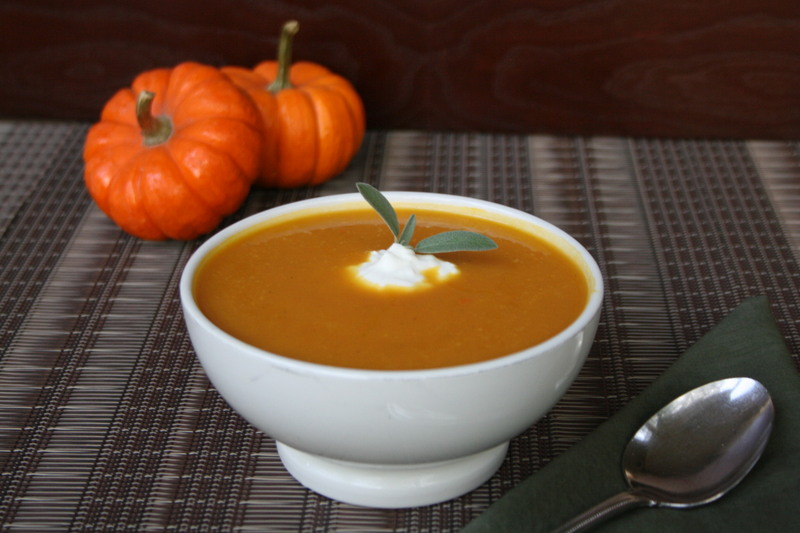 You’ll enjoy it so much, serve it as a side dish year-round or make a smaller batch to use as a stuffing for pork chops. Preheat the oven to 350 degrees. Grease a 9- x 13-inch casserole dish with butter and set aside. Place the cornbread in a large mixing bowl and set aside. In a large skillet over medium-high heat, warm the oil until a few droplets of water sizzle when carefully sprinkled in the pan. Add the sausage and cook, breaking up the meat with a wooden spoon, until the meat is browned and cooked through, about 8 minutes. Transfer the cooked meat to a colander and drain off the excess fat. Transfer the drained sausage to the cornbread mixing bowl. Drain all but about 1 tablespoon of fat from the skillet. Reduce the heat to medium. Add the onion and celery. Cook, stirring occasionally, until soft, about 4 minutes. Transfer the cooked vegetables to the cornbread mixture. Toss to combine. In a medium mixing bowl whisk together the chicken stock and eggs. Add to the cornbread mixture and toss to evenly coat. Season with salt and pepper to taste. Transfer the stuffing to the prepared casserole dish. Bake, loosely covered with foil, until set and warmed through, about 30 minutes. 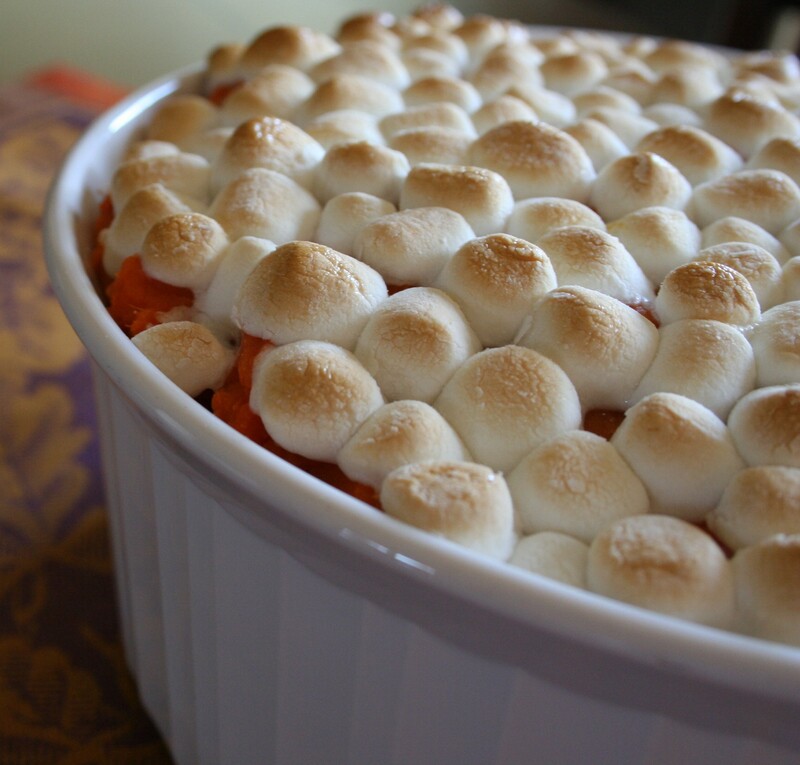 Remove the foil and bake until the top is browned, about 15 minutes. Serve warm. Cooking Tip: You can either make your own cornbread or pick up an already prepared pan at your local market.